The Annexe is part of a complex of charming country cottages in a beautiful setting of the Avill Valley between Dunster and Timberscombe, within the Exmoor National Park. This property is well-suited to families having two bedrooms, one with double bed and one twin bedroom. Set slightly apart from the other cottages, The Annexe has uninterrupted views across our fields and the Avill Valley, and catches the afternoon and evening sun. The 4-star complex of cottages consist of a variety of cottages with varying numbers of beds to best suit your needs whether that's sleeping 2 guests or up to 6 per cottage, making this an ideal place to holiday as a family, with your children, as a couple or in a larger group. Entry to The Annexe is over a little wooden bridge and then up two steps, to the French Doors. Downstairs there is a kitchen and dining/living room with a woodburner. Upstairs there is a double bedroom, a twin bedroom and a bathroom (with shower). Bed linen is provided, towels can be hired for £3 per person. The cottages are set within 9 acres of land that you are welcome to explore, there are picnic areas and a safe river for paddling - in warmer weather! There is also a shared information room where guests can find a payphone, information brochures, children's books, videos and DVDs. As The Annexe is the furthest cottage from the main car park, this property has an allocated car parking space in the secondary courtyard approx 35 meters from the front door. Any additional cars can be unloaded here but should then be parked in the main car park. and North Devon have wonderful coastlines and  stunning countryside, just waiting for you to explore! Full arrival information and details of how to access the property will be sent after your booking is paid for in full. 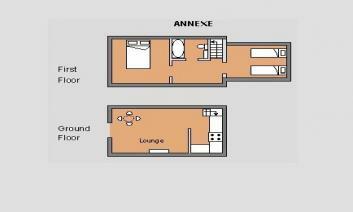 I booked the Annexe, as it looked exactly what we wanted for a quick September break. 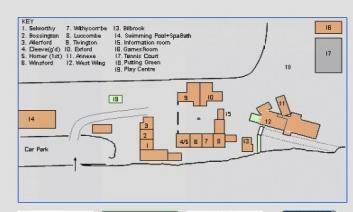 Peace to read and relax, Tennis on site, swimming, games room fantastic! On arrival, Richard the owner greeted us and showed us to our accommodation for the next 6 nights. 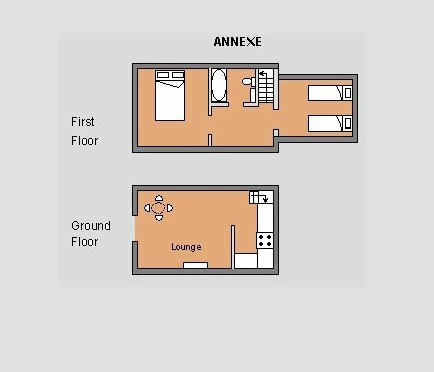 As soon as we entered the Annexe we new we had got it very wrong... it was dark and when you turned the lights on, it was quite obvious it was unloved and needed a very good clean!! Richard offered to clean the property the following morning for us, but after one night with a doggy shower, we just felt we had, had enough and we wanted out. 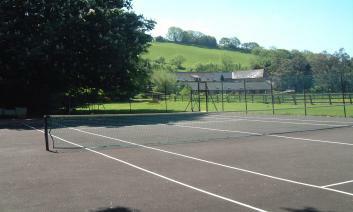 The tennis court was unplayable due to moss covering the court, and a broken net. When I mentioned this to Richard he said they where fighting a battle with the moss as the court is positioned under trees, the net would be replaced. We just felt that everything was lovely twenty years ago, but now every thing seemed really sad, and needed a good spruce up to standard. I didn’t use the pool, but to be fair it looked clean and nice. Overall nothing looked like it did on the website, we felt trading standards would have had a field day. Having said all of the above, When we discussed the issues with Richard, he very kindly moved us into a much nicer newly renovated barn at no extra charge. So in the end after a poor start, Richard did make the accommodation work for us. We thank him very much for that. 4 Guests maximum. Infants don't count toward the number of guests.